JUST A FEW PLACES LEFT! 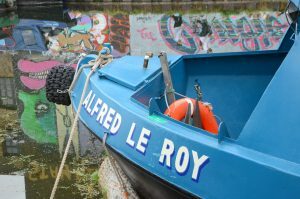 Join us on board the Alfred Le Roy for a relaxed boat tour of the Lea Navigation, visiting the reedbeds and riverine vegetation that provide habitats for wildlife and improve the water quality. Commentary from and Q and A with the Thames21 Love the Lea team. The tour will finish at the Crate Brewery in Hackney Wick. Limited spaces so this will be first come first served. Please register for future similar events.